He was speaking ahead of a visit to Russia on Monday, during which Iran is likely to feature prominently. Iran's nuclear programme will also be one of the main issues for the UN nuclear watchdog's annual conference, starting in Vienna on Monday. Iran denies it is trying to acquire nuclear weapons, and says it only wants nuclear power to generate electricity for civilian purposes. But it has repeatedly rejected UN demands to give up the enrichment of uranium, which the US and other Western states fear is being diverted to a nuclear weapons project. 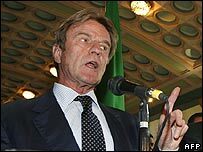 Mr Kouchner said negotiations with Iran should continue "right to the end", but that an Iranian nuclear weapon would pose "a real danger for the whole world". He said a number of large French companies had been asked not to tender for business in Iran. Mr Kouchner will seek agreement with Russian Foreign Minister Sergei Lavrov over tighter UN sanctions to try to force Iran to give up enrichment, the French foreign ministry says. Russia has a UN Security Council veto over any new sanctions, and its support is seen as vital for any new approach. 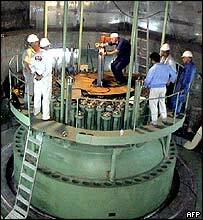 It also has perhaps the greatest leverage over Tehran, as the supplier of fuel for its nuclear reactor. But Mr Kouchner said even in the absence of UN action, the European Union should prepare its own sanctions against Iran. "We have decided while negotiations are continuing, to prepare eventual sanctions outside the ambit of UN sanctions. Our good friends, the Germans, suggested that," he said. Iran has warned that any new punishments could push it to stop co-operating with the UN nuclear watchdog, the International Atomic Energy Agency (IAEA). The IAEA's members meet this week in Austria, with Iran likely to top the agenda. The director of the organisation, Mohamed ElBaradei, has been criticised in the West over a new deal with Iran to clear up questions about its past nuclear activities. The US and its allies believe the deal just gives Iran more time, during which they fear it will advance its nuclear programme. Since becoming foreign minister earlier this year, Mr Kouchner has not shied away from controversy. Last month he was quoted as saying the Iraqi government was "not functioning" and seemed to hint that Prime Minister Nouri Maliki should resign, provoking an angry reaction from Baghdad. The BBC's diplomatic correspondent Jonathan Marcus says France has changed its approach to world affairs under its new President Nicolas Sarkozy, adopting a harder line on several issues, and seeking to improve relations with the United States. But it is the tougher rhetoric aimed at Tehran which will please Washington the most, he says. Until now the UN Security Council has imposed economic sanctions on Iran, but did not allow for military action.